Pilots are a great way to test out a new system (if done right). We want to eliminate all guesswork for you, so that you can really focus on what matters. 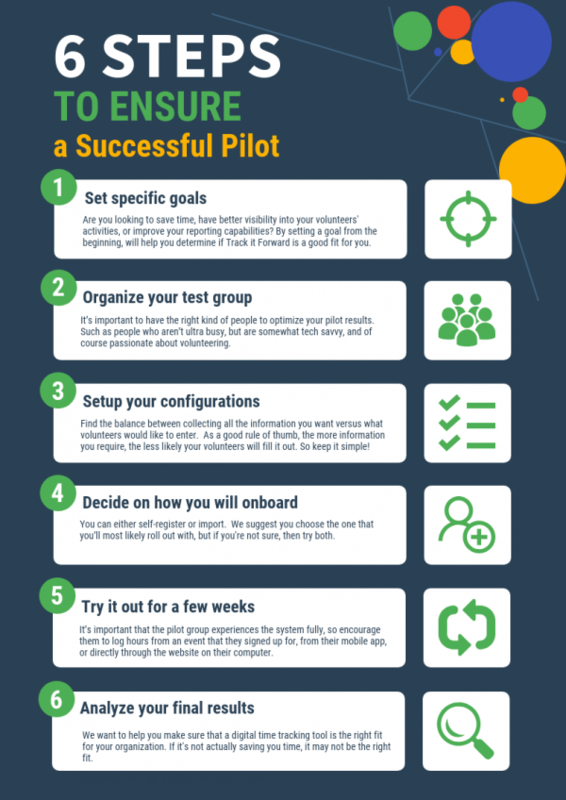 So we're going to share the SIX basic steps you need to follow to make sure that your pilot is ON POINT! Before you begin your pilot, write out a list of goals that you’d like to achieve so that you have some metrics to compare to at the end of the pilot. Are you looking for better visibility, have more accountability, or are you trying to improve your reporting capabilities? Depending on what you’re looking for in a volunteer time tracking system will help you make a decision when your pilot is over. Select a key group of volunteers and staff that are interested in helping you test the system. It’s important to have the right kind of people to optimize your pilot results. Focus on people who aren’t ultra busy, are somewhat tech savvy, and of course passionate about volunteering. Our go-to motto is “keep it simple and ask for what really matters”! Find a balance between collecting all the information you want versus what volunteers would like to enter, because the more information you require, the less likely they'll want to fill it out. How you onboard your volunteers can be super critical to the success of your program. There are two ways to onboard your volunteer, you can have them self-register (which will save you as the organizer time) or you can import them into the system and invite them to start logging hours (which gets you moving right away). We suggest you choose the one that you’ll most likely roll out with, but if you're not sure, then try both! It’s important that the pilot group experiences the system fully, so encourage them to log hours from an event that they signed up for, from their mobile app, or directly through the website on their computer. Work out the kinks, answer their questions and get feedback from everyone. Change up some things and try it again. After your pilot is over, compare your results with the goals that you initially set out to achieve. We want to help you make sure that a digital time tracking tool is the right fit for your organization. If it's not actually saving you time, it may not be the right fit. We’ve worked with thousands of organizations, and maybe we have a solution for you that you haven’t explored yet!